Much more than just a standard bus charter service, Boomerang Bus Hire can also organise personalised bus tours on and around the Sunshine Coast. Whether you're looking for a 2 hour excursion, or a weekend break, we can fill your blank canvas with an exciting Sunshine Coast tour based on your exact requirements. We'll happily work from scratch, or build around any pre-formed ideas. 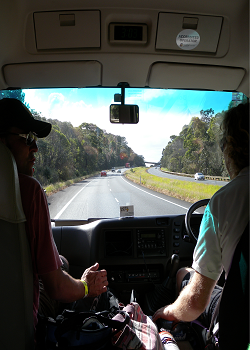 So if you need to entertain a group on the Sunshine Coast, regardless of their age or interests, contact Boomerang Bus Hire for fresh ideas and inspiration. Not only is our planning service totally free, but if you book a personal itinerary day tour with Boomerang Bus Hire, we'll throw in a FREE sausage sizzle lunch for everyone in your group. Freshly cooked by our staff, who are trained in food handling, we also cater for vegetarians, gluten free and any other dietary requirements (if known in advance). We understand that a priority for groups is organising a great tour that will entertain everyone, and also fit comfortably into your budget. Simply combine the Boomerang Bus Hire free itinerary service, free lunch and economical transport, and the result is a great tour at a great price. Call 1300 BUS MAN or email us with your requirements, and we'll create a personalised tour that your group will love.